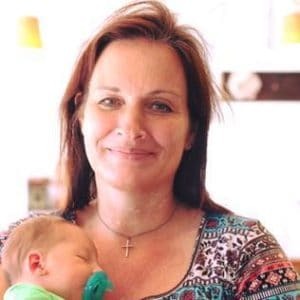 March 17, 2019 0 comments on "Traditional Irish Soda Bread Recipe"
Does Irish Soda Bread Freeze Well? Is Irish soda bread really Irish? Yes, it is! And it’s not just for St. Patrick’s Day. Along with shepherd’s pie, Irish soda bread ranks right up there with many other favorite Irish recipes. While you might think that the recipe for traditional Irish soda bread has been around for hundreds of years, it has actually only been around since the early 1800’s, when baking soda first made its appearance in Ireland. Irish soda bread is a very basic bread that contains no yeast. Many poor people did not not have ovens in their homes, so this bread was often cooked in an iron skillet over an open fire. The Irish ate this bread with their meals and had to make new loaves of bread every 2 to 3 days. Such was life in those days. What gives this irresistible Irish soda bread a unique texture is the combination of baking soda and buttermilk. The acid in the buttermilk reacts with the baking soda, creating small bubbles that makes this bread uniquely soft yet dense in texture. The Irish often used sour milk in the place of the buttermilk. After searching around for the best Irish soda bread recipe, I decided to try Martha Stewart’s recipe for Irish soda bread. There are slight variations in soda bread recipes, which I will discuss in a little bit, but most recipes, such as Martha Stewart’s recipe, include caraway seeds and raisins, a must for making traditional Irish soda bread. This is the recipe I tried out for St. Patrick’s Day this year. *If you don’t have buttermilk, you can make your own homemade buttermilk by adding 2 tablespoons of lemon juice or white vinegar to 1 1/2 cups of milk. Heat oven to 350 degrees. Line a cookie sheet with parchment paper. You are definitely going to want to line your cookie sheet, because the dough will be a little bit sticky and you don’t want it to stick to your pan. In a large bowl, stir together flour, sugar, salt, baking powder, and caraway seeds. Cut the cold butter into small chunks. Use butter from right out of the refrigerator. Using two table knives or a pastry blender, cut the butter into the flour mixture until it resembles coarse crumbs. Stir in the raisins. In another bowl, mix together buttermilk, large egg, and baking soda until well combined. Pour the buttermilk mixture into the flour mixture and stir just until all the liquid is absorbed. The dough will be a bit sticky. If it is so sticky it completely sticks to your hands, add another 1/2 cup or so of flour. The dough should be slightly sticky, but not so sticky you can’t get it off your hands. Use your hands to press the dough into a round dome that is about 8-9 inches across. Place the dough on the lined cookie sheet. In a small bowl, mix together the egg yolk and the cream. Using a sharp knife, cut a large “x”, about 1/2 inch deep, in the top of the loaf. Brush the egg yolk mixture over the entire loaf with a pastry brush. Place the cookie sheet in the oven and bake for about 70 minutes, or until the loaf is golden brown and a skewer placed into the center of the bread comes out clean. If the bread gets brown too fast, place a piece of aluminum foil over the loaf for the remainder of the baking time so that the bread doesn’t get to brown. Remove from oven and place on baking rack to cool. So that’s the traditional Irish soda bread recipe, as far as I can tell. I did some searching for other types of Irish soda bread, and this is what I found. 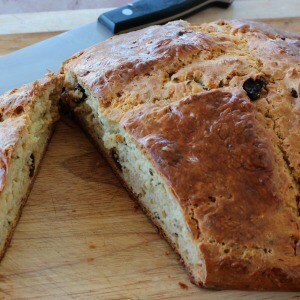 I am sure there are several different versions of “grandma’s” favorite Irish soda bread recipe. Not all Irish soda bread recipes call for caraway seeds. One of the recipes I found that claimed to be grandma’s recipe did not have caraway seeds in it. So if you don’t want to include the caraway seeds, just follow the recipe above, and leave out the caraway seeds. Another variation I found calls for baking the bread in an iron skillet, much as the Irish probably did. I am going to have to try this next time. If you want to have nice plump raisins in your bread, you can soak the raisins in a little water for 1/2 hour before preparing the bread. Drain the raisins before you add them to the recipe. Some people swear by doing this. I didn’t do it for my bread and the bread turned out great, but I may try this next time to see if I can tell the difference. So I didn’t even know that Safeway Irish soda bread was a thing, but apparently they do feature a popular soda bread and are kind enough to share the recipe. Their recipe is similar to Martha Stewart’s except they use half the raisins (1 cup), much less caraway seeds (1 tsp. ), and less sugar (3 tbsp). So this will result in a slightly less sweet Irish soda bread. They also don’t use the egg wash on top of the bread. Otherwise their recipe is prepared the same way. Yes, Irish soda bread DOES freeze well, you can freeze either the entire loaf or slice it up and freeze it. Wrap it in aluminum foil and freeze for up to 3 months. De-thaw the bread in the refrigerator. 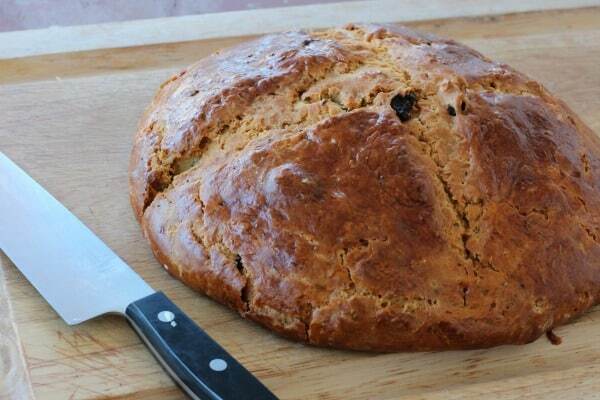 Irish soda bread can be served warm or at room temperature, but it is best served warm. It does dry out quickly, so wrap it in aluminum foil and eat within 2-3 days. To re-heat your soda bread, place on a cookie sheet and bake at 325 for about 10 minutes. Irish soda bread is a great accompaniment to soups and stews. It is also great served warm with a citrus jam such as orange marmalade. Follow my baking board on Pinterest.